Figure drawing can be defined as the study of human form based on its different shapes and body postures including standing, sitting and sleeping. It refers to the stylized depiction or the study of human form which uses the form and the line of human figure as the main objective instead of using the subject person. Experts also define it as composed images of subjects that are in stationary position. If you want to become an artist, then you have to keep in mind that figure drawing is one of the most difficult subjects to tackle so you have to be really serious in improving your skills in this area before you perform tasks that are linked to it. The figure of humans is viewed by many as part of the most enduring visual arts themes or subjects. It can even be used as a basis for cartooning, sculpture, comic book illustration, medical illustration and portraiture. If you are serious about becoming an expert in this field, then you have to know that the figure drawing process can be simply done just like when you are creating a gesture drawing. You can also make it even more elaborate by adding more details into it with the help of pencil, charcoal and any other drawing tools. It should also be noted that you can use various approaches when it comes to drawing a human figure and these include drawing from live models, from skeletal models, from your imagination or memory and from photographs and any other reference materials. If you are one of those who dream of becoming an expert in the field of figure drawing, then you should know that enrolling in the figure drawing certification program which is now available at Brainmeasures can offer you a lot of help. You can expect the figure drawing course offered by Brainmeasures to cover all the vital aspects linked to figure drawing so becoming a real expert in this field will no longer become impossible. With the help of this online certification course, you will get the chance to undergo a highly comprehensive figure drawing training which is guaranteed to work when it comes to mastering all the vital concepts linked to the figure drawing field. You can also expect the figure drawing certification course from Brainmeasures to help you in your attempt to understand all the instruments and approaches that you can use in figure drawing. 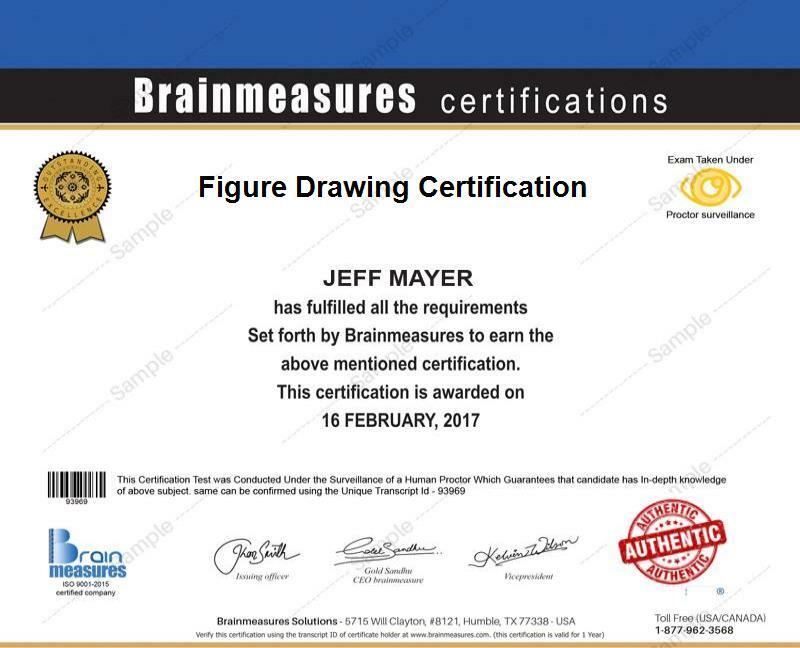 By earning your figure drawing certificate from Brainmeasures, you will no longer find it hard to impress the public with your skills and expertise in this specific field. How to best present emotions in the drawn facial features? The figure drawing certification program which is now available at Brainmeasures is a huge help for you whether you are a beginner in the field of figure drawing or an artist who has a little background in this specific field. You can expect this program to help you in boosting your confidence and improving your figure drawing skills. This is perfect for you if you are aiming to strengthen your background about figure drawing so you can continue impressing the public. Earning a figure drawing certification is a major help when it comes to accessing numerous projects with higher pay. As a figure drawing certification holder, you will get the chance to become an artist who is capable of working at the comforts of your own self-being where you feel like your passion in drawing exceeds your expectations. Aside from working at your own pace, you can also work in an art studio. Just make sure that you market your skills in the most effective manner possible as this will allow you to bring in more figure drawing projects. Earning a figure drawing certification can help you increase the level of your income. As a figure drawing certification holder, you can use your skills and expertise to earn at least $50,000 per year. Note that you can earn higher depending on the number of your clients, the company or the art studio where you are working, your specific location and the remuneration benefits provided by your employer.